Simple, honest ingredients to Keep Your Chin Up. Suitable for vegetarians. 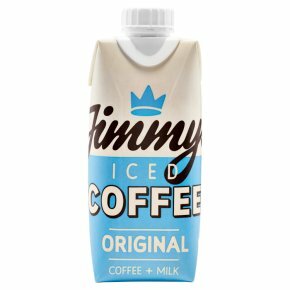 Jimmy's Iced Coffee Original, the straight up coffee one. It's the perfect combination of Rainforest Alliance certified Arabica Coffee from Huila, Columbia, semi skimmed British milk from West Country farms and a touch of sweetness from 1.5 teaspoons of unrefined Demerara sugar.